Kwesé TV was recently launched in Nigeria few days back we dropped some information about the launching, no doubt the pay-Tv is now live in Nigeria and we have the full list of Channels available as well as the decoder and subscription fee. The new Pay-TV is a Zimbabwean satellite and broadcasting network owned by Econet Wireless Zimbabwe, under Econet Media. The owner is from Zimbabwe and goes by the name Strive Masiyiwa. 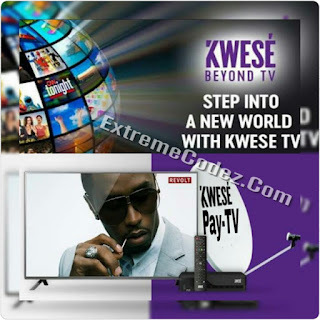 Don't forget that the Kwese Pay Tv service currently available in other African countries like Ghana, Rwanda, Zambia so you should have it in mind that is not only Nigerians that will enjoy this newly pay-tv. As for the price of Kwesé Decoder and dish in Nigeria, it goes for N10,960 which includes free installation service. Available channels ranges from premium entertainment, News, Sports, Lifestyle, Business, Faith etc. Kwese TV shows LIVE Premier League matches according to the information on their official website. The complete channels is listed below. The above listed channels includes free to air channels such as Africa News, Flow TV, NTA, Islam TV and Kwese sports. You can equally check more information about Kwesé TV in Nigeria as well as subscription prices. We smell serious competition, don't forget TStv decoder is around the corner as from 1st of November according to the information from them if they will truly fulfill their promises.